This route starts just south of a small town called DeArmanville, AL. From DeArmanville, take US Hwy 431 south. Go about a mile or two and you will come to the intersection of Route 281 and take a right and head west towards the state park on Route 281 (This is the beginning of this route). (WARNING: The Eastern most five miles of this road are extremely dangerous to motorcycles as the asphalt is covered in loose stone. Do not attempt any sharp turns or high speeds!) After you pass through Cheaha State Park Route 281 will dead end abruptly and you must turn around and go back through the park. Once you get through the state park and come off the mountain look for Route 49 and take it to the right (south). Follow 49 sown to the routes' end point of Lineville, Alabama. 281 Runs along the spine of Cheaha Mountain in Eastern Alabama near Talladega and offers beautiful scenic views of 20 miles. The countryside is unspoiled by urban sprawl and is heavily wooded inside the Talladega National Forest. Wildlife abounds and it is not uncommon to see deer, hawks and other animals. Route 49 comes off the south side of the mountain and rolls through farms, meadows and small towns. If you like scenery, this route is for you!! Route 281 sweeps along the back of Cheaha Mountain at a blistering pace. There are several slower switchbacks and decreasing radius turns that will make even the most experienced motorcyclist grin from ear to ear. The asphalt along 281 is pristine and well marked. 49 offers up several miles of tight twisties as it comes off the mountain on good asphalt. The state park store on the top of the mountain offers most of the basic necessities including gas. The Cheaha State Park has some fantastic cabins that include whirl pool Jacuzzi hot tubs. The are also a couple of gas stations in Lineville. on August 31, 2010 4 out of 4 members found this review useful. This was a great ride, we did it this past weekend. 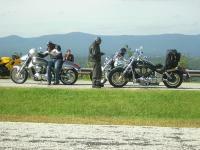 I have to tell you though, the best ride was country road 12, just south of Cheaha park. Right as you are going down the mountain heading south, you will see a sign pointing to the right for Anniston/Talladega. This is a tight little old road with a TON of fun turns. I loved the beauty and fun of the main skyway, but this backroad was a ton of fun! on February 23, 2016 3 out of 3 members found this review useful. I just did most of this route on the 19th. It is still breathtaking even with a light midst covering most of the tree line. The road quality is great and the turns are epic. Riders the asphalt is smooth and mostly free of debris but there are multiple instances of steep downhills leading to hard turns so care must exercised. The right hand turn off from 281 southbound on to Cheaha Rd towards Anniston deserves its own route listing. on March 24, 2009 1 out of 1 members found this review useful. Just a note: 281 does end but now you can take a small paved road to the left now (watch for loose gravel) and when it dead ends after about 2 miles, you can take a left to end up on 49 or a right to end up on 77. I just like to have a continuous ride and not have to back track so this road helps you do that. on October 9, 2013 0 out of 0 members found this review useful. GREAT RIDE rode 2 up plenty of plsces to pull over and take pictures. Very very little traffic. We rode from Talledega up to the top of Mt. Cheaha ate dinner at a great restaurant . Then we rode down the other side back to Talledega. on March 3, 2012 0 out of 0 members found this review useful. Great trip with lots of scenery and curves. The road quality varies as some of it is paved with oil and gravel chips and has some loose gravel. The road has plenty of turns and hills and is a wonderful ride but like all roads caution must be used. The road has limited access so turning cars and driveways are limited. Our ride through here was in the December and most of the trees were bare but it is still a great ride. on February 13, 2009 0 out of 0 members found this review useful. I would like to this ride this spring but one biker forum says the Skyway road quality is terrible now. They mentioned "tar snakes". If the road is ok I will go to see the Dogwoods. on August 22, 2008 0 out of 0 members found this review useful.